Phymatotrichopsis omnivora is a soilborne fungal pathogen that can infect over 2300 species of plants, but is perhaps most famous as a pathogen of cotton. Infection leads to the destruction of root cortical tissue and rapid death of the plant. It is estimated that Phymatotrichopsis root rot accounts for 1-3.5% annual loss in cotton production in Texas (the largest cotton producing state) and 2-6% annual loss in Arizona (8). Significant losses also occur in production of apples, chile peppers, grapes, kenaf, peaches, and pecans, and of avocados and mangoes in Mexico. Many landscape plants are also susceptible, and disease can be an intractable problem in housing developments within heavily infested areas, as often occurs where a development is built atop a former cotton field. Phymatotrichopsis omnivora’s name gives tribute to its omnivorous appetite. The list of potential hosts is not only long, but widely various, with over 2300 species dispersed throughout the dicotolydonous families. Monocots have generally been considered immune to the pathogen under field conditions, though fungal strands of the pathogen have been found on the roots of various monocot species, including corn. P. omnivora is native to the region encompassing the southwestern US and northern Mexico. 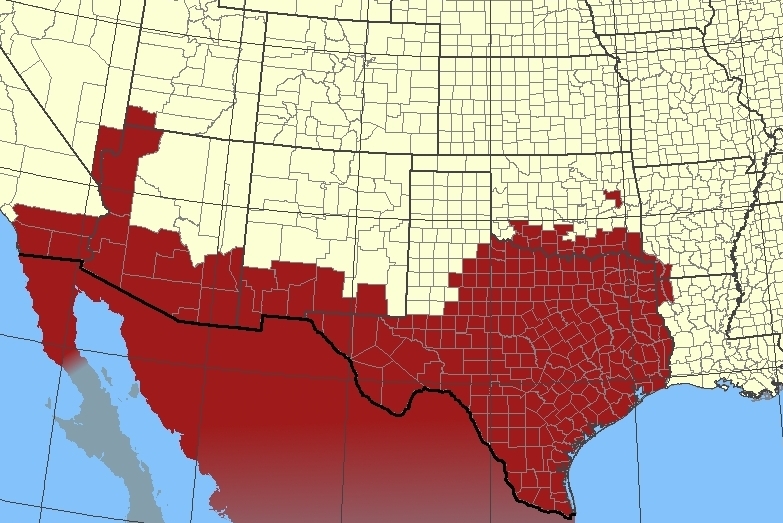 Many of the native plants within this region are resistant or tolerant to the pathogen. The pathogen distribution is limited to areas where soil is high pH (optimally 7.2-8.0), low in organic matter, and usually calcareous (>1% CaCO3), and where mean annual temperatures are above 16 ºC. The fungus is most active at high temperatures and in moist soil; in many areas, its distribution is associated with river basins and washes. Disease symptoms usually occur from late summer through early fall, when the pathogen is most active. 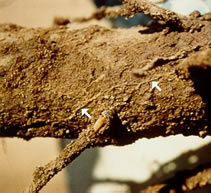 Phymatotrichopsis root rot results in rapid death of the plant; so rapid, that death may be the first symptom observed. Leaves become chlorotic, then bronze, as the plant wilts. The leaves remain firmly attached to the plant in death. In trees or shrubs, death may be somewhat slower, and leaf symptoms may be visible first on one side of the plant. Even mature trees, however, may be killed within a few weeks of developing initial symptoms. Affected roots are soft and decayed, and the cortex may be easily pulled away from the stele. The stele may show reddish-brown lesions or discoloration, and on some hosts, a reddish lesion may also be visible around the crown. 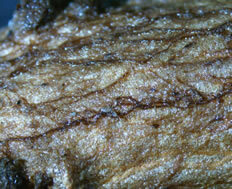 The surface of the roots will be covered with the tan to golden-brown mycelium of the fungus. Under conditions of high moisture, white to pinkish, buff or tan spore mats may be visible on the soil surface near the crown of the infected plant. 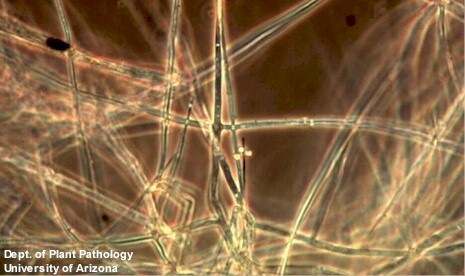 P. omnivora produces hyphal strands consisting of a large central hypha surrounded by numerous small hyphae, bearing cruciform setae (cross-shaped side-branches). These strands resemble lengths of twine and protect the hyphae as they grow through the soil. When a strand contacts a root, it proliferates around the root surface, decaying the root tissue and growing upward along the root until it reaches the hypocotyl, destroying the periderm, blocking the xylem cells, and killing the plant. Sclerotia may also form along the strands, typically in the coarser strands near the plant root. The sclorotia are white at first, then turn to buff, brown, and finally black; they range in size from about one to five mm and are irregularly shaped, taking the shape of the pore space in which they form. Each cell within the sclerotium has the potential to germinate; thus, a single sclerotium may germinate multiple times. Sclerotia can survive in the soil for many years: estimates range from greater than five (under lab conditions) to twelve or more years in the field (1,11). Because they are typically formed near an active infection on a host plant, sclerota follow a clustered distribution in the soil. The majority of viable sclerotia are found at depths greater than 30 cm, with as much as 79% of sclerotia at greater than 60 cm (6). This may be in part because sclerotia formed near the surface are subject to microbial degradation and their numbers don’t accumulate. P. omnivora also produces conidia, but the conidia are not known to play a significant role in the fungal life cycle or pathogenesis. Conidia are formed in mats on the soil surface during periods of frequent rain and high humidity. The mats appear at the base of infected plants, and single-celled conidia are borne on the swollen apices of conidiophores. Phymatotrichopsis thrives in warm, moist soil conditions. It is most active when soil temperatures reach 28ºC. As a pathogen, it is classified as a necrotroph, killing root tissue and then using the dead tissue as a food source. It is, however, a very poor competitive saprophyte; it does not compete well against other organisms for organic matter sources in the soil. Identification of this pathogen is typically done by observation of symptoms and signs alone. The presence of hyphal strands with cruciform branches is considered diagnostic, and there is usually no need to culture samples. As such, there are no diagnostic tests available for Phymatotrichopsis. Ozonium auricomum Link - original identification given by Farlow to Pammel in 1888 for a fungus found on rotting cotton roots (9). Ozonium omnivorum Shear - name given in 1907 when Shear examined the reference culture of O. auricomum and concluded that the Texas pathogen was not the same fungus. He based his distinction on the characteristic cruciform setae, and noted that O. auricomum did occur in Texas, but only as a saprophyte (10). Phymatotrichum omnivorum Duggar - name given in 1916, after observations of conidial mats showed conidial formation similar to other Phymatotrichum species (4). Although Duggar referred to this placement as “tentative” in 1916, the name remained until 1973, when Hennebert synonymized Phymatotrichum with Botrytis and created the new genus, Phymatotrichopsis (5). The name Phymatotrichum remained in common use, however, for several more decades. Because a sexual state has never been confirmed for P. omnivora, its proper placement within the fungal kingdom has been a source of debate since its original identification. Most early authors presumed it to be a basidiomycete, if they chose to speculate at all. In 2005, however, DNA sequences (nuclear ribosomal DNA, RNA polymerase II subunit 2, and beta-tubulin genes) were used to construct phylogenetic trees, and trees for each region examined indicated that P. omnivora belongs in the ascomycetes, within the order Pezizales (7). This organism can be somewhat difficult to isolate. Reported viability of strands (i.e., success rate of isolation from strand segments) ranges from 10-61%, with decreasing success from older strands (12). Water agar or PDA with 100 ppm each of chloramphenicol, novobiocin bacitracin, and penicillin G (12). To induce sporulation in culture, transfer to sporulation medium and place under lights for a 16-hour day cycle (3). Sclerotia may be wet sieved from soil and plated on above isolation media for confirmation of identity and viability. However, this method is not considered reliable as a soil test for the presence or quantification of the pathogen. In order to determine whether a site is infested, a “field bioassay” is usually recommended, wherein a susceptible tap-rooted plant (such as cotton) is sown in the site and observed for development of disease. There are no highly successful management practices for Phymatotrichopsis root rot. Although there are fungicides that are effective against the pathogen, its ability to produce sclerotia deep within the soil allows it to escape the fungicides. As the plant roots grow beyond the reach of the fungicide application, they contact the pathogen and become infected. In combination with early planting, this delay of infection might be enough to recover significant yield increases. However, the progression of this disease can be extremely rapid, and if favorable conditions prevail, the delay may not be sufficient. Chemical control is prohibitively expensive for most field crops, and not enduring enough for most other crops. Thus, management approaches tend to focus on avoidance or alteration of the soil environment. Avoidance. In landscape situations, the most common recommendation for a property owner with a Phymatotrichopsis infestation is: how about a nice palm tree? P. omnivora tends to occur in small, slow-spreading patches, and can be contained in a landscape by planting non-hosts (monocots, such as palm trees or turf grass) or resistant or tolerant species (such as native desert plants) in the infested area. In some crop situations, non-host or resistant species may also be an option; however, there are currently no resistant cultivars for cotton, alfalfa, or other susceptible crop species. Some crops, such as carrots, are susceptible but able to avoid infection by the timing of the crop. If a crop can be harvested before temperatures climb into the optimum range for disease, or if planting can be delayed until cooler temperatures return, disease problems can be avoided. For warm season crops like cotton, rotation with non-hosts (usually corn or sorghum) is used to reduce disease pressure. Soil Management. In many landscape situations, replacing the existing plants with a palm tree or cactus is simply an unacceptable proposition. In cases where a particular plant is exceptionally important to the landscape, it may be possible to protect the plant through intensive management of the surrounding soil to create conditions unfavorable to the pathogen. Some trees have been successfully protected, or even salvaged after initial infection, by loosening the soil around the tree to just beyond the drip line to create a shallow basin, and then adding a layer of organic matter (manure or compost) topped with a layer of ammonium sulfate and sulfur (488 g/m2 or 0.1 lb/ft2 each). The basin is then irrigated heavily for several weeks to incorporate the amendments. This creates a zone around the roots of the plant with lower pH and higher organic matter, which is unfavorable for the pathogen. This treatment has to be repeated every year in order to maintain protection. Treatment should be conducted in spring, before the soil reaches optimum temperature for disease and allows the pathogen a head start. These same principles have been applied with some success in orchard situations, as well, by using cover crops incorporated as green manure, and by applying sulfur in trenches (1.2-1.8 m or 4-6 ft deep) around infected trees to limit the spread of the pathogen and protect surrounding trees. http://nt.ars-grin.gov/fungaldatabases/new_allviewgenbank.cfm?thisName=Phymatotrichopsis%20omnivora&organismtype=Fungus - USDA site which includes a partial list of hosts (877 host species) and specimens, with citations. 1. Blank, L. M. 1953. The rot that attacks 2,000 species. In Plant Diseases, edited by A. Sterrerud: US Dep. Agric. 2. Cook, C. G., and Riggs, J. L. 1993. Isolation and Identification of Phymatotrichum Omnivorum from Kenaf in the Lower Rio-Grande Valley of Texas. Plant Dis. 77:1263-1263. 3. Dhingra, O. D., and Sinclair, J. B. 1995. Basic Plant Pathology Methods. 2nd ed. Boca Raton: Lewis Publishers. 4. Duggar, B. M. 1916. The Texas root rot fungus and its conidial stage. Ann. Mo. Bot. Gard. 3:11-23. 5. Hennebert, G. L. 1973. Botrytis and Botrytis-like genera. Persoonia 7:183-204. 6. Lyda, S. D. 1984. Vertical and horizontal distribution of Phymatotrichum sclerotia in Texas soils. Phytopathology 74:814-814. 7. Marek, S. 2005. Molecular phylogeny of Phymatotrichopsis omnivora. Paper read at Annual Meeting of the American Phytopathological Society, 30 Jul - 3 Aug, at Austin, TX. 8. NCC. 2007. National Cotton Council Disease Database: 1952-2001 National Cotton Council of America, 14 March 02 2002. Available from http://www.cotton.org/tech/pest/index.cfm. 9. Pammel, L. H. 1888. Root rot of cotton, or "cotton blight". Tex. Agric. Exp. Stn. Ann. Rept. 1:50-65. 10. Shear, C. L. 1907. New species of fungi. Bull. Torrey Bot. Club 34:305-317. 11. Taubenhaus, J. J., and Ezekiel, W. N. 1936. Longevity of sclerotia of Phymatotrichum omnivorum in moist soil in the laboratory. American Journal of Botany 23:10-12. 12. Wheeler, J. E., and Hine, R. B. 1969. Viability and occurence of mycelial strands of Phymatotrichum omnivorum in Arizona. Phytopathology 59:1057.